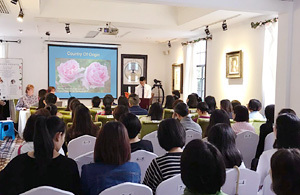 A new teaching and healing centre located in Guangzhou, China, opened in mid November, and for its opening event Quinessence directors Sue Charles and Geoff Lyth flew over to hold the first ever aromatherapy lectures at the venue. It was also a great opportunity for Sue and Geoff to meet with some of their Chinese customers for the first time, since many had travelled from Beijing, Hebei, Macao and Hong Kong to attend. One dedicated student flew in from Malaysia to attend the inaugural event. Over the two day event (18th & 19th November 2017) held at the Healing Elements Centre, Sue and Geoff spoke to a packed house of over 100 students teaching a wide range of aromatherapy subjects. Since the main classroom could not accommodate all the attendees, a video link was set up to broadcast the lectures to the ground floor classroom. There were also DIY workshops running throughout the event making lip balms, lipsticks, skin care creams, and other aromatherapy goodies. On day one, the morning was dedicated to newcomers to aromatherapy, with lots of questions and answers to help cram as much information in as possible during the available time. The afternoon lectures were geared towards qualified aromatherapists, and again the session included a Q&A section that provoked some probing questions showing the students had been really attentive. These were serious students! 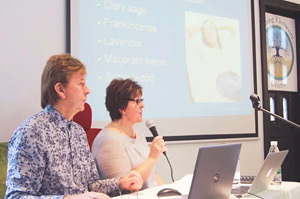 The lectures on the second day were for aromatherapists only, once again including the all -important Q&A sessions to clarify details of some of the subjects and case studies covered. After the lectures were completed there was an epic photo session where just about every student who hadn’t had to dash off to catch a bus, train or plane had their photograph taken with either Sue or Geoff. Or in some cases, both of them! You can see some more of the photos taken at the event here. Before flying back to the UK, Sue and Geoff also held an impromptu talk for a ‘book group’ at a large local bookstore. 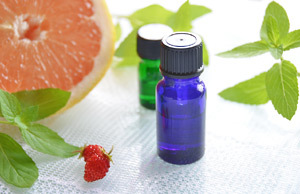 The owner had attended the lectures and was keen that her members also had the opportunity to hear from the experts and ask a wide range of questions about essential oils and ‘real’ aromatherapy. The attendees were not disappointed, and after the lengthy question and answer session more photos were taken, and finally everyone went home happy. The Healing Elements Centre is the brainchild of Ciecy Tan, who is the Asian representative and distributor of Base Formula and Quinessence aromatherapy products. 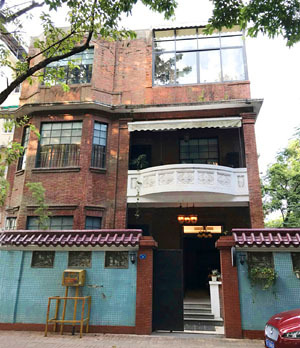 After a long search for the right venue to develop the centre, Ciecy finally settled on a beautiful British colonial-style building in the Yuexiu district of downtown Guangzhou. 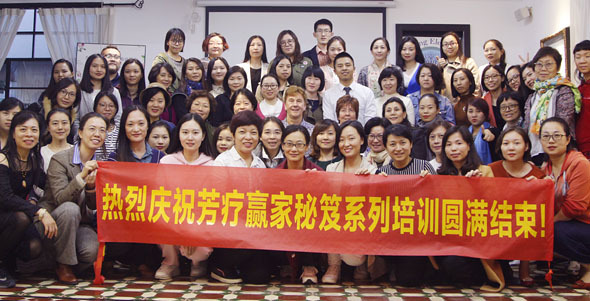 Ciecy explained, “Aromatherapy is gaining popularity in China, and having been involved with Base Formula and Quinessence over the last year in the UK I began to realise what a huge difference there is in the quality of information and education available to people in China. I felt I needed to introduce ‘real’ aromatherapy here. Therapists in China seem to lack the confidence to take their qualification directly to a full time career, and those that do usually work alone and feel isolated. What’s missing is a platform where they can freely share their experiences with other like-minded therapists and receive genuine support – a sort of ‘home’ for aromatherapists. And most of all, they need high quality post-qualification training to boost their confidence and skills. The Healing Elements Centre provides all of this, and more. “We have a lovely, peaceful venue where professionals and the general public can also come to learn more about aromatherapy, plus they can both get access to quality services and products. 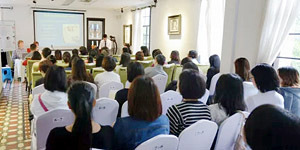 As I am fortunate to be part of a great team here in Guangzhou we thought the very best way to start was to persuade two of the UK’s leading aromatherapists to come to China and lecture to both new and experienced therapists alike. 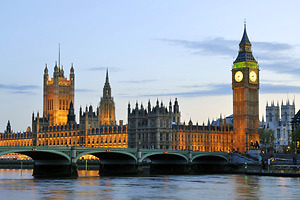 I’m glad we did, because the response has been fantastic.” added Ciecy. 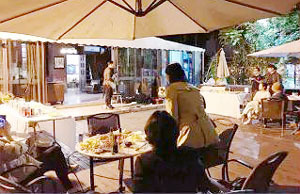 In the evening after the event had concluded Ciecy had generously arranged a thanksgiving party for everyone outside in the garden. 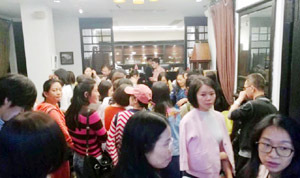 Food and drink was in plentiful supply, and the evening’s entertainment was provided by a well known guitarist, Lan Hai-peng, followed by an enthusiastic karaoke session that brought all the festivities to a close. A good time was had by all! Plans are underway for Sue and Geoff to return to the centre next year for further teaching sessions. The address of the Healing Elements Centre is:- No 11 Xingxing Road, Yuexiu District, Guangzhou City, Guangdong Province, P.R. China. To obtain details of all upcoming training courses and events in Guangzhou, please use the WeChat QR code below to contact the centre. Copyright © Quinessence Aromatherapy Ltd 2017. Written by David Howell. Top: Students arriving after registration. 2nd down: Geoff Lyth and Sue Charles. 3rd down: 1st floor class. Above: Students enjoy making products during the ground-floor workshop. 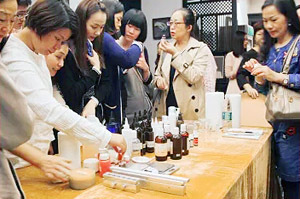 Top: The Healing Elements Centre - a 'home' in Guangzhou for aromatherapists and beginners alike. Above: After the lectures were finished on 19th November 2017, Ciecy organised a thanksgiving party outside in the garden for everyone. A great time was had by all!